By combining a sleek frame with a smooth lens shape, the Tifosi Podium Shield Multi-Lens eyewear helps to improve aerodynamics when speed is paramount and offers the wearer a crystal-clear view. 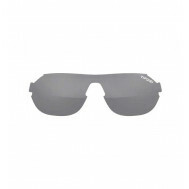 The frameless design accommodates shatterproof lenses that virtually eliminate distortion, give sharp peripheral vision and offer full UVA/UVB protection. The lenses flex instead of shatter upon impact. Tifosi’s sunglasses are made of Grilamid TR-90, a homopolyamide nylon characterised by an extremely high alternative bending strength, low density, and high resistance to chemical and UV damage.